A venomous snake is a snake that uses modified saliva, venom, delivered through fangs in its mouth, to immobilize or kill its prey. Venomous snakes include several families of snakes and do not constitute a formal classification group used in taxonomy. The term poisonous snake is false - poison is inhaled or ingested whereas venom is injected. (In contrast, a few non-venomous species are constrictors such as pythons, anacondas, and boa constrictors which suffocatetheir prey.) Snake venom can contain many different active agents, and can potentially be a mix of neurotoxins (which attack the nervous system), hemotoxins (which attack the circulatory system), cytotoxins, bungarotoxins and many other toxins that affect the body in different ways. Snake venom is never a single type of toxin. Venomous snakes that use hemotoxins usually have their fangs to secrete the venom in the front of their mouths, making it easier for them to inject the venom into their victims. Snakes that use neurotoxins, such as the mildly venomous mangrove snake, have their fangs located in the back of their mouths, with the fangs curled backwards. This makes it both difficult for the snake to use its venom and for scientists to milk them. It has recently been suggested that all snakes are in fact venomous to some degree. 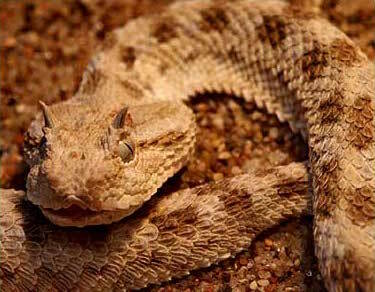 Snakes all evolved from a common lizard ancestor that was venomous, from which venomous lizards like the gila monster and beaded lizard also derived. The research suggests that snakes all have venom glands, even species thought totally harmless such as the Corn Snake, commonly kept as a pet. What differentiates 'venomous' from 'non-venomous' is the evolution of a venom delivery system, the most advanced being that of vipers, with fangs that are hinged to prevent self envenomation, and curl out as the snake strikes.